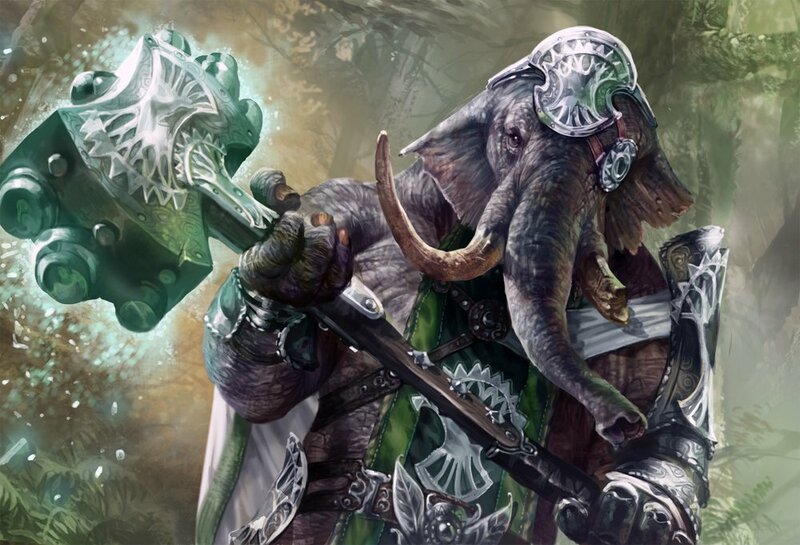 Dungeons and Dragons will be making its maiden voyage to the city-wide plane of Ravnica later this fall, where you will find many wondrous creatures, including the mighty Loxodon, whose power and wisdom makes them perfect for players looking to play frontline brawlers and support casters. The Guildmaster’s Guide to Ravnica will introduce a number of new concepts to D&D, including the Circle of Spores Druid and the Order Domain Cleric, but it will also feature several new PC races. You’ll see everything from Viashino to Vedalken and back, including the focus of today’s spotlight, the mighty loxodons. These powerful pachyderms can pack a mean punch. 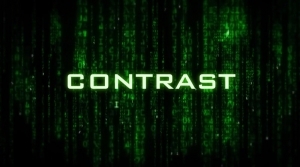 But before we get into what they do, let’s talk a little about who they are. Ravnica is a massive city-wide plane, and Loxodons are one of the rarer sights within it. They typically tend to be found in Selesnyan Conclave, which means they are all about protecting nature and community–but there’s a big paladin/cleric undertone to most of them. 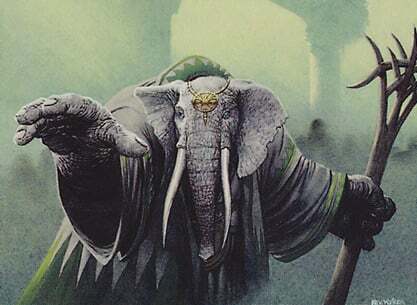 If you look at some of the famous Loxodon cards (and some of the not famous ones), you’ll find Loxodon Hierarchs and Smiters, and are classified as Elephant Clerics, according to the arcane taxonomy of Magic the Gathering. 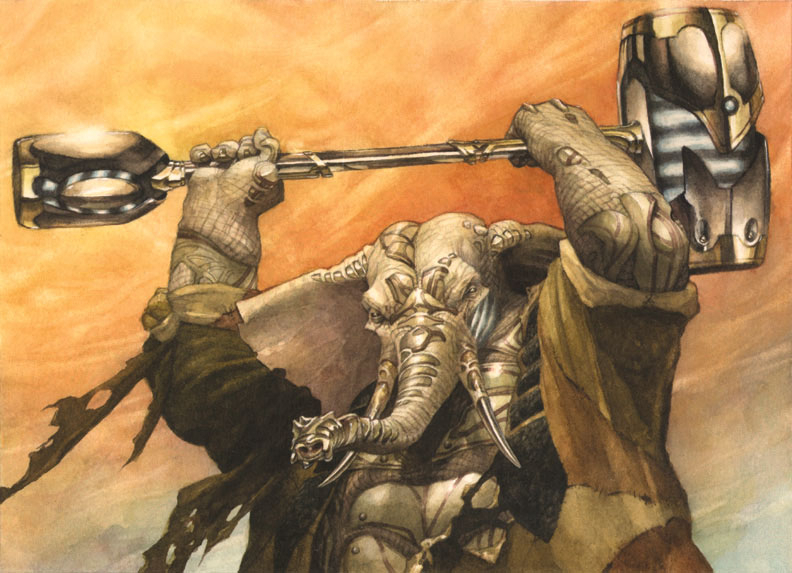 Even looking outside of Ravnica to the other big Loxodon-heavy plane, Mirrodin, shows us mystics and monks. Wherever they show up, Loxodons seem to drift into priests and warriors and druidic types. They are also skilled crafters, known for their skill at working stone and metal. They are all consummate smiths, which seems like a great way to launch into what the PC race is actually like. As mentioned above, Loxodons are crafters through and through. This is reflected with racial traits like Stonecunning and Mason’s Proficiency serving as nice ribbons that grant them proficiency with mason’s tools and expertise in History whenever making a History check related to Stonework. Keen Smell rounds out the ribbos, giving you advantage on perception and investigation checks that rely on smell. As far as what their build actually grants them, you get some pretty stout stat bonuses, starting with +2 Constitution and +1 Wisdom, making them able to compete with Dwarves for strong Cleric choices. They also make excellent Monks, and might be one of the stronger races with Powerful Build and Natural Armor–this one in particular is pretty spicy. It grants these elephant-men a 13+Dex modifier natural AC bonus, which is better than most folks with natural armor get. It’d be even better if you didn’t rely on your Dex and could let the 13 stand in for the Dex half of the equation when putting together AC combos for Barbarians and Monks, neither of whom can combine their Con or Wis bonuses with the Loxodon’s inherent armor to get even more AC. Which is good–I don’t think they need that, but it would be nice to say, as a Barbarian, my AC is 13 + Con modifier, or what have you. Finally they’re rounded out with Loxodon Bravery which gives them advantage on saving throws against being Frightened. So all in all, good stat bonuses that skew them towards divine casters and burly brawlers, but I’d be curious to see what other builds come out of the options in Guildmaster’s Guide to Ravnica. If this doesn’t change, you’ll see a lot of graceful pachyderms running around Ravnica later this year. But here’s the thing, we’re only seeing the Unearthed Arcana version for now–surely one day soon we’ll be seeing the updated Loxodon, or the finalized, so keep your eyes out for a survey if you have any feedback changes.